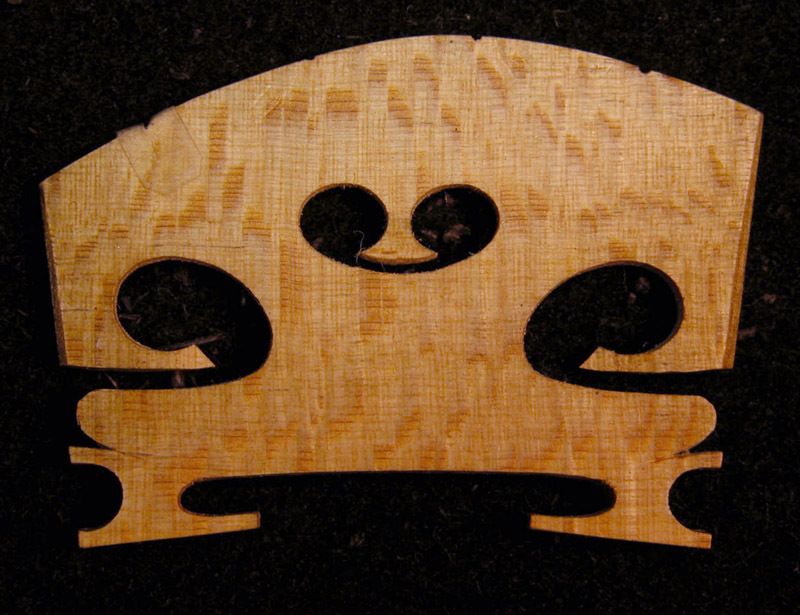 In a former post, Manfio showed the picture of a Michael Darnton's violin bridge. I have been unsuccessfully searching the forum. Does somebody remember wich one was the thread? May be you are trying to find this thread? Hi Strado, can you show us a pick of one of your current bridges? A little off the subject but here's one from me, since one hasn't been posted yet. That's a mighty jolly lookin bridge! this to balance out the strings, to play more even, or some other reason maybe? Bruce, I like your bridge, especially wood selection! I played a bit with camera yesterday and photographed an old bridge that was laying around and, funny thing, the background l used looks similar to yours. Was it back of cigar box by any chance )? The area circled in the photo is so enormously impactful as a final shaping of the violin's sound. Tiny shavings can make such a big difference. 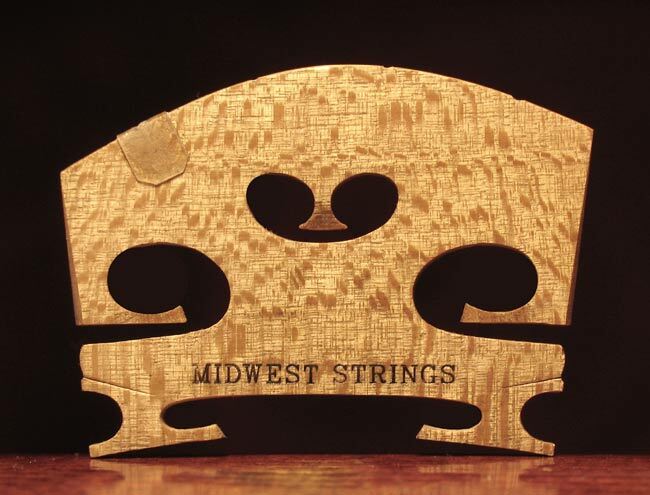 Do you custom trim/ tune each bridge in this area on the instrument? The photograph was shot against my bench pad which is of thick dark compact wool. This type of pad is nice because when you're working you don't get light reflected back into your eyes from the bench lamp. The bridge as you see it, for me, is a starting point. I wouldn't remove any more wood unless, after a time, the musician and myself felt it was necessary. Going in gradual steps over a period of time is usually the best way. Once you've removed too much you have to start over! Thanks, I see what you mean regarding the grain lines. Hoped I discovered your secret regarding bridge photo background, but was far from it . That woolen cover is also very good as a photography background I must say. Fully into the subject and useful as always. Actually the thread title could be turned into "Nowadays bridges". How did bridges evolved following the new string technology and players needings. I have never noticed that the area you circled is especially important. Can you cite some evidence for why you think it's important? What frequency vibrations it supports or dampens? I have to confess that I usually use a stamp but it didn't seem the proper thing to do on the bridge for the Cannon though it would have been great publicity (if publicity is what is really needed ). 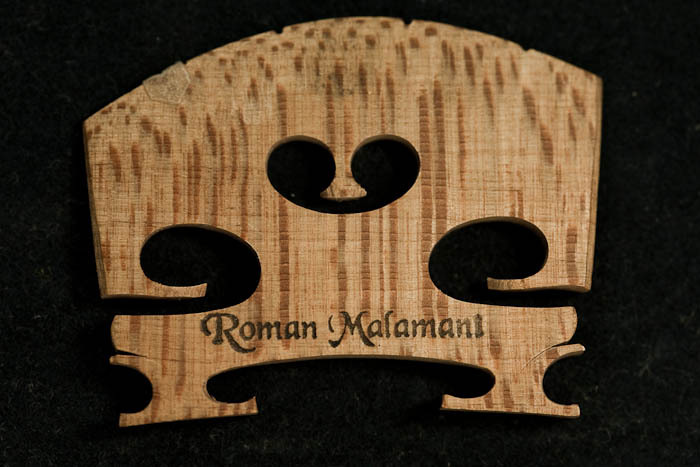 The fact that it is used on that violin doesn't really change the way the bridge was cut. 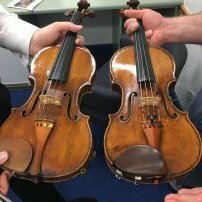 Congratulations for putting up the alarm about the closing of the musical instrument collection of the Victoria and Albert Museum. Come on Maestronetters, sign up on the link that Joe Robson attached to his post! You asked earlier about what I based my observations on in respect of the circled area. It has primarily to do with the clarity of the sound. It's a remarkably sensitive area to assist in the creating of the bow "bite" or "crunch" that musicians like, vs. the wah wah sort of feel under the bow.